This bin is built using one 4x8 sheet of the extra-thick lattice panels. The "open" feature of the lattice allows for quicker, easier composting. It's easy to take apart, which is all you have to do when you want to use the compost. This good-sized box is best for vegetable gardeners - a place to compost your grass, carrot tops, corn shucks, tomato stems - anything from your garden. The 24-inch dimension means that no part of the interior is ever more than 1 foot from available sources of oxygen and nitrogen - critical for complete composting. This means you don't have to touch your compost after throwing it in - no stirring, no turning, no layering, no having to transfer from one bin to another. The 2-foot narrow dimension assures that your yard waste, etc. will compost evenly and completely over the course of the composting year. If you need faster composting, Build a Tumbling Composter. Trellises are popular for growing climbing vines like morning glories or pole beans. But the ones sold at garden centers are often expensive. Saplings can be used, but these rot quickly. Using fairly cheap materials, you can make a very sturdy support on your own, and it should last for years. If you are looking for a great way to grow fresh veggies, fruits or herbs at home, and want to make it a little easier on yourself (and in many cases your back), raised beds are a great way to go. Not only are raised beds beneficial for many “growing” reasons, but if you have an eye for design, you can construct raised beds in such a way, that will have your neighbors awestruck. Here is our list as to what makes raised bed gardening a huge plus for your yard. 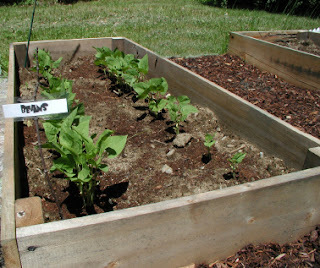 Comment below to tell us why you have raised beds in your garden. You can make them as high as you want. If you have problems with your back and/or bending over you can elevate your raised beds without any ill effects on your plants. If you decide to build your raised beds out of wood, it makes for a great way to attach other items to your raised beds, such as your bean or pea trellis, maybe a few PVC hoop houses and so on. Because your raised beds are elevated, it will create a perfect scenario to allow for excess water runoff. This helps in preventing overwatering. You can create raised beds that are large enough for many plants, yet small enough where you can work your raised beds without actually having to step into the garden. When you do not step on the soil you are not compacting it, therefore the roots of your vegetable plants can breathe. They are easier to weed. While I have no “scientific” data to back this claim up, to me, I have found keeping my raised beds weed free, is much easier then my larger garden bed that is not raised. There are plenty of step by step instructions online for building great raised beds. Find one that suits your yard, size, gardening style and so on. You won’t be disappointed. If you have ever cooked with garlic then you already know the wonderful aroma garlic emits. Whether you are frying garlic up to mix with some onions for a steak or adding garlic to a sauce, garlic is the epitome of recipe versatility. So it makes you wonder why garlic is not grown more at home. Garlic is easy to grow, as you will see, all you need to do is get the space ready in your garden, set up your soil and choose a variety. Let’s start with the space your garlic will need. This will depend on how much garlic you want to grow, but when planning, account for 6 inches of space between each garlic clove planted. In a four foot by four foot raised bed, that accounts for ninety-six garlic cloves planted (if my math serves me correctly). If that amount is too much, and really, can you plant too much garlic? Just be sure to down size accordingly. Now that you know your space, you need to set up the soil your garlic is going to grow in. 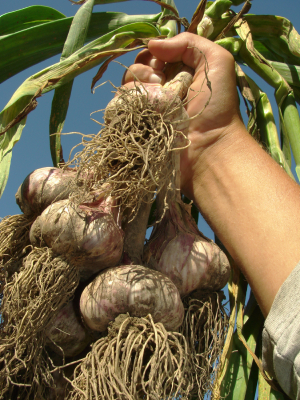 Garlic loves soil that is rich in organic matter and drains very well. If you are planting your garlic in a raised bed that will help with the drainage. As for the soil itself, mixing in some peat or coir with finished compost or even well seasoned manure along with some perlite or vermiculite will go a long way. As a side note, try to keep your soil’s pH above 5.8 but less than 7. When planting the garlic clove, the pointed end should be facing up. If you plant the clove upside down your garlic will develop a curved shoot and that will lead to misshapen bulbs. Garlic comes in two basic varieties, hard neck and soft neck. They are then broken down into a larger number of types. Your local garden center or co-op can tell you which types grow best in your area. While you can plant the cloves from the garlic available at your local supermarket, it is not recommended. You will not be sure which variety of garlic you are getting or whether or not that garlic can even grow in your area. Purchase plantable garlic cloves from your local garden center, organic if possible. Once you have your garlic cloves planted, be sure to cover with 3 inches of mulch to help protect them from potential frost. Straw or hay works great. This helps protect your cloves as well as keep weeds to a minimum. It also helps conserve moisture in the soil. The soil for your garlic needs to be moist. Water regularly, however, do not overwater. You don’t want to saturate the soil. The best rule of thumb when it comes to harvesting your garlic is, when half your leaves are brown and the other half are green, your garlic is ready to be pulled. This may vary based on variety and your location, but it’s a good rule to get you going.